To understand what you are buying, you should know a comb-binding machine punches small rectangular holes on the side of the paper and holds the plastic comb open while the operator threads the pages onto one side of the open comb. After all of the pages have been loaded, the comb locks together to prevent pages from falling out. 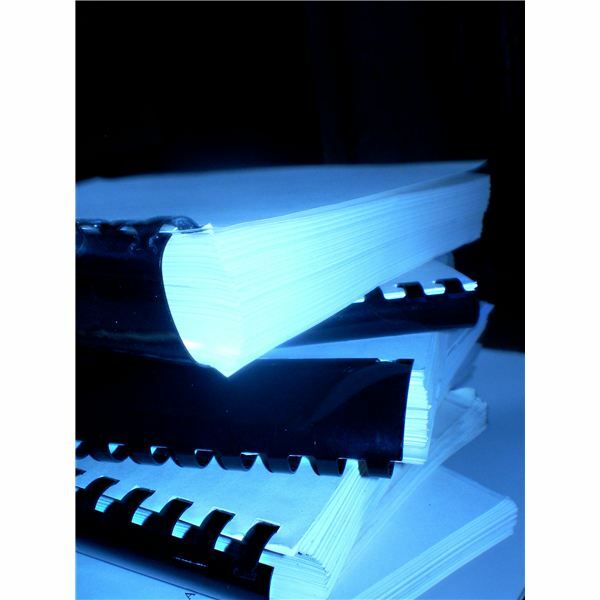 The difference in price for comb binding machines has more to do with whether the machine punches the holes manually or electrically, the maximum number of pages punched at a time and the number of books bound per month. For example, for a print shop or other heavy-duty production environment, the need for speed and the ability to withstand continuous use is the biggest consideration. For this application, the most prominent tabletop model on the market is the Rhino-O-Tuffs HD 7700 Ultima sold for $4,595.00 able to produce thousands of books per month. Considered by many to be the fastest, strongest and most productive comb binding machine on the market, the HD 7700 Ultima punches up to 40 pages at a time and punches paper up to 14" long. 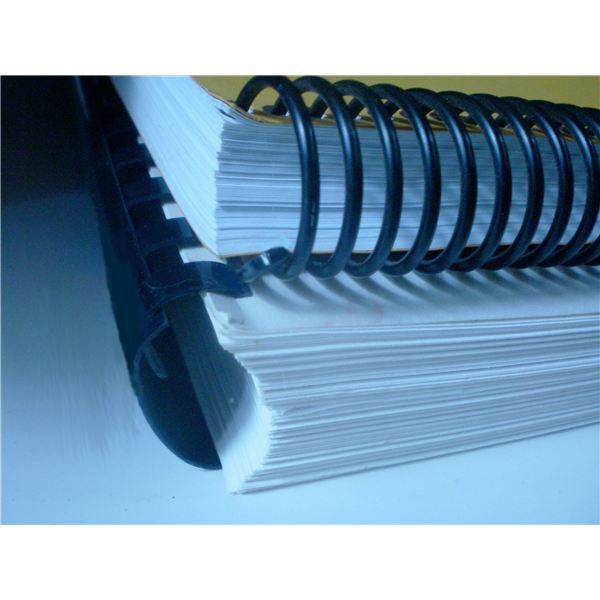 Made for those who have a large amount of books to bind, these models are sold to copy centers, print shops, advertising agencies, accountants, universities and other offices that have a need for a long-lasting, strong comb binding system. The HD 7700 Ultima electric motor is quiet until the punch is activated and the actual punch is much quieter than many other comb-binding machines. A best seller for over 25 years, the GBC C800 pro costs $2,225 and is a favorite among those who bind a few hundred books per month. However, this binding machine is not a good choice for users that do a lot of legal-length binding since it is limited to punching paper 11" long. A more versatile and less expensive machine is the electric SircleBind CW-4500 that offers dual punch patterns for both plastic comb and wire binding. A best seller in the low to medium volume under a hundred binds per month field, the $499 price tag makes it an economical buy for small offices. Ergonomically designed so that the operator can flow through the punch and bind process efficiently, it is easy to use, has built-in guides that make aligning the paper, closing the wire loops, or spreading plastic combs simple and seamless. The machine also features a built-in wire hanger that allows the operator to align the punched paper through the wire effortlessly. Designed with capacity in mind, the CW-4500 has a punching capacity of 25 sheets for comb and 20 sheets for wire. Another less costly alternative to the heavy-duty binding machines, the Akiles MegaBind 2 is also very versatile with a 14" punching throat for legal sized documents and a twin loop wire closer that will work with Spiral-O 19 loop wire. What is more, the cost of this machine is just $354.95. What is the difference? Punching holes on this machine is manual, with a 20 page punching capacity and a double handle system that allows punching and binding at the same time. Built for low to medium use, this machine is for those who bind fewer than 60 books per month. At 99.95, the Fellowes Star Manual Comb Binding Machine is a light duty machine for the home office. It manually punches up to 10 sheets at a time and has a document thickness guide that helps users select the proper comb width. The manual machine loads vertically rather than horizontally and binds up to 150 sheets with a ¾" comb versus the usual 2" maximum comb on the more expensive machines. This machine is for very, very light use, but for the money, a good deal. Reviews from consumers say it is an easy to use sturdy machine. The only drawback is that you do have to make sure the paper is pushed in deep enough to make clean cuts. This machine is small and compact but if you're binding less than 25 books per month, this will more than fulfill your needs. What makes a top five comb-binding machine? A Fellowes Star Manual Comb Binder would not be the top pick in a heavy-duty professional environment just as Rhino-O-Tuffs’ heavy-duty model would be a waste of money for the home office. The top comb-binding machine is the one that fits your needs, your speed, and your pocket. Personal experience and knowledge of author who owned a print shop for 13 years.